At the Shakujii Station on the Seibu Ikebukuro line in Nerima Ward, Tokyo, I was waiting for a graduate of Reading University in UK, Émilie and her friend Xavier to have an afternoon meeting. 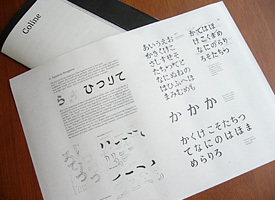 Since Émilie designed Japanese characters for multilingual font as her graduate work, she wanted to ask Japanese people about her design during her private trip to Japan. Last week, Kimura, who is my junior in Kyoto City University of Arts, told me about Émilie. As Kimura had been in Typo/Graphic Studies in London College of Printing, now known as London College of Communication, he got email from his former-classmate in UK that Émilie wanted to ask Japanese about her design when she come to Japan. It would be nice but I thought she supposed to ask her request with type designer for Japanese font in order to get proper advice, so I arranged to visit Type Project, is the foundry known for making AXIS font, plus asked a type designer Okazawa of Yokokaku, who left Jiyukobo and started his office last month, to join our meeting because I hoped the meeting would be a good chance sharing type design topics. In fact, I knew Émilie because her classmate Eben Sorkin, who I met at TypeCon Seattle two years ago, emailed and asked me to help Émilie for making Japanese characters last year. I couldn’t get any reply for a long time, but I was glad to hear she would come to Japan. The meeting began with the presentation of the cityfont.com web site that Type Project launched last month, and then Suzuki of Type Project introduced about the Driver’s font. We asked Emilie some questions about the type design trend in European countries and the situation type designers are facing now. As I was also interested in the curriculum of the MA type design course of Reading, I asked her about it and the difference with the one of KABK. We talk about Émilie’s work. 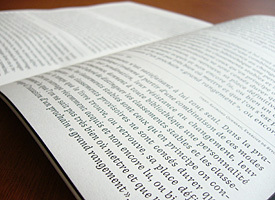 Émilie introduced her type design named Coline showing her great small specimen book. It was really nice and interesting work, I thought there’s no Japanese typeface like this style, and Coline might be fit for a magazine that featured natural organic items or casual fashion which women are interested in. When I saw the letters in large size, strokes seemed a little too dynamic and wild for the body text, but small size letters set in the column box, it seemed to be natural and calm, and strokes created comfortable rhythm. She asked some questions about what the key factor is for making proper Kana forms, then, Suzuki mentioned that the importance to think about the order of the strokes in Kana because the stroke consequences came from the order of strokes would affect the forms of Kana letters. And added some tips for designing Japanese letters. Left: Émilie explained about her design. 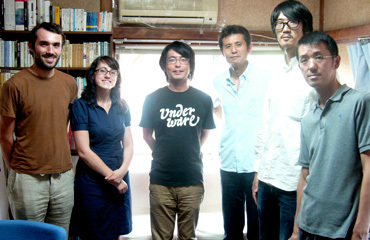 Right: Left to Right, Xavier Antin, Émilie Rigaud, Satoru Kimura, Isao Suzuki of Type Project, Hideyo Ryoken of Type Project, Yoshihide Okazawa of Yokokaku. It was only for three hours visiting in Type Project but we enjoyed having chat with them, and Émilie and Xavier also seemed to enjoy this meeting. I hope the meeting would help for her work and we hope to meet again in future. It would be nice we could meet again somewhere in the world, say at a type conference. And I’m looking forward to seeing Coline will be released. Speaking a type designer based in overseas who designed Japanese font as a non-native speaker, it reminds me of Joachim Müller Lancé, who got Morisawa Award. I know the difficulty of making typeface in non-native language as I’m also one of designers making Latin alphabet. I expect those try to design Japanese font like Mr. Lance and Émilie will gradually increase, and I also hope I’ll be able to use Japanese font made by a designer who is non-native Japanese language. I’m sure they bring new styles which I have never seen to Japan. 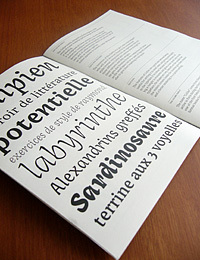 The specimen book of Coline. 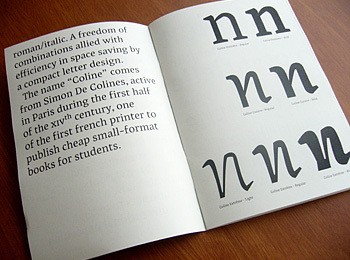 The PDF of this specimen is available to download from HERE.